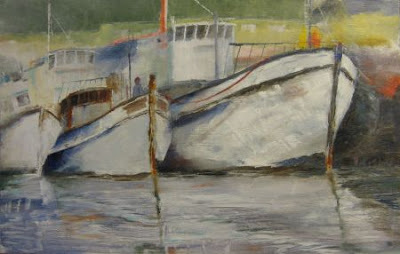 Another day of painting in the harbour. This time we went after lunch and painted facing the boats. About 4.30 we then turned our easels around so that we were facing Chapmans peak drive and painted the sunset. I would say that this was the second most exciting "painting en plein air" I have experienced. The mist on Tafelberg still takes number one! As I've seen these both in the original form, I think they're both totally amazing, but I especially like the second one! Your love of plein air shows through in all of these. Hi Carol, both are beautiful paintings. You are very blessed to be living in Cape Town. 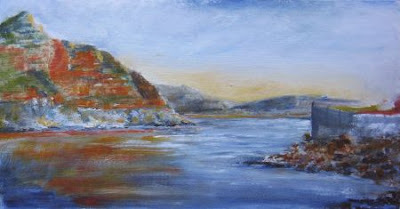 I would like to invite you to join the Group "South Africa Plein Air" (http://pleinairartists.ning.com/group/southafricapleinair) on the network 'Plein Air Artists'. We would love to see your art there and hear about your plein air adventures. Thanks Liz - wish you would join us - maybe one day I will be able to persuade you? Thanks Barbara - you really should try a boat - actually quite difficult! They have so much personality! Thanks for the visit - yes, we are blessed and we really do appreciate it! Thank you for the invite. I went to see your new web site and I think it is a wonderful idea. I havent had much spare time lately but as soon as things quieten down I will definately join. I really think SA artists should become more proactive on the net. I see that Di Mc Naughten paid you a visit too. Lovely person and very talented artist.